Samson Marzbani is a French pianist with Persian and Indian roots. Ever since his youth, improvisation has been at the centre of his artistic activity. 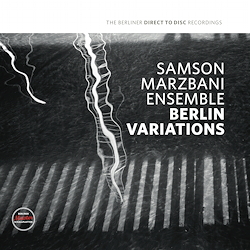 With these Berlin Variations, the Samson Marzbani Ensemble presents a recording that cannot be classified in any of the conventional genres. The artists improvise quite freely on purely acoustic, and – in a wider sense – classical instruments. The result is reminiscent of the music created by the band Can, or that of the early Pink Floyd, although even this attempt at some sort of classification does not do justice to all aspects of this special music.